Attack on Titan has taken the world by storm; with a popular manga and anime series, the property has seen a lot of success. After a long wait the 3DS game, Attack on Titan: Humanity in Chains is finally leaving Japan and allowing the rest of the world to join the ranks of the Scout Regiment. The Atlus published game, previously announced for Western and European release during the 1 April Nintendo Direct, will be releasing exclusively on the eShop on May 12 in North America. Sadly, the release for European regions has been delayed, and with this delay comes a change in name as a result of a copyright claim - it'll now be called Shingeki no Kyojin: Humanity in Chains in Europe, which is the name of the original Japanese release. Atlus has stated it's aiming to resolve the copyright related issues and release in Europe as soon as possible. On a brighter note, purchase of the game in both regions will also come with a free 3DS HOME theme that will not be available via any other means. Along with the announcement of the release date, Atlus has released a new trailer showing off the various characters that players can take control of throughout the game. You can watch the trailer below. Are you excited for this one? What other anime would you like to see turned into games? I'm usually on board with whatever Atlus brings out but I'm on the fence with this one. It needs to score well for me to consider it. I don't even care if this game is bad, I'm getting it no matter what!! Problems for an European release, what a shocker. I don't particularly mind in this case, because I have a buttload of exams to... ''tide me over'' until pretty much the end of June. So I wouldn't have time to play it before anyway. If the review scores are half decent, I'll get it. What's the issue with the rights? 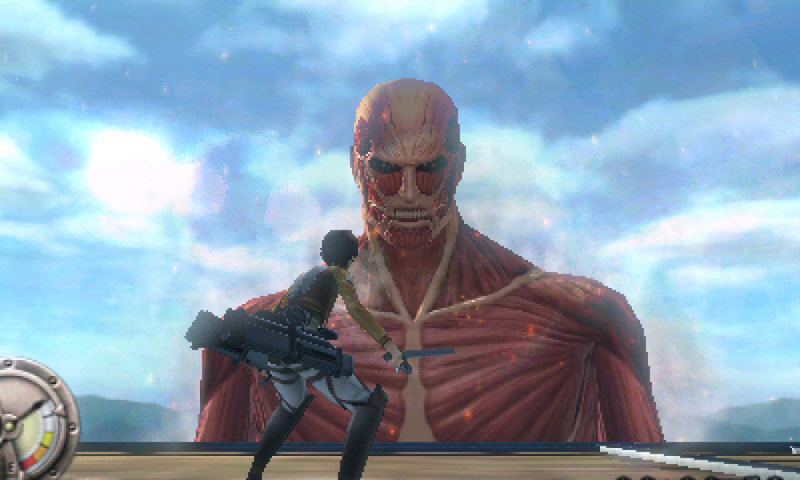 So, is this just like... killing titans? Don't get me wrong, I love the show and I love the concept of it, but I hope there's some more..."meat"... to the deal. Who am I kidding, i'll be buying it regardless most likely because this is the first anime I've watched ritually since Gundam Wing and Dragon Ball Z on Toonami. I'm just curious as to what else goes on when you're not wrangling up those naked bipeds. I noticed Japanese voice acting in the trailer. I wonder if that's just a placeholder or not. I'm going to go ahead and blame France for the delay purely because I feel like blaming France even though it's nothing to do with them. So yeh, thanks a lot France! @Goob There's no dub for this one. I need to see reviews first. Then I'll judge. Mmmm... yesss that music.... One of the best parts of the show. @LinkSword Huh. I thought the reason why they waited so long to bring the game to other regions was so that they could use the English dub/VA. Not that I'm complaining — the dub wasn't particularly good imo. I only got into the series after watching it on the eShop, so they were successful there. Personally, I'd be put off the game if the VA was in English. Hope they get everything sorted for that European release! I watched the first two episodes they put on the eShop. Was a bit surprised that they used the Japanese audio, but I enjoyed it nonetheless. Had a "War of the Worlds" vibe. I'd probably want to watch more before deciding if I wanted the game. It seems like a fitting universe for a Monster Hunter-esqe game. Will get it regardless of the review, I'm hoping more of anime adapted game would come here so I'll support Atlus for doing this! I'm usually waiting for discount for Atlus game though as they often go for a steep discount not too long after the game released, but this is one game I'll probably get day one just to support it. I'm kinda having a problem buying this digital exclusive game at a full retail price of 40 dollars. Especially when European gamers who buy this game, will get a Attack on Titan home Menu for free and North American gamers won't. How typical of NOA. From what I've seen of the game it's not something I'd be willing to pay full price for, but it's cool that the game is coming out here nonetheless. @ColdingLight Says you can get the theme in NA, however you can only get it by buying the game. So the game has online multiplayer, heard that it didn`t but Atlus did say it does so I will probably get it. Copyright claim? Don't they own 'Attack on Titan'? YES!, The waiting is almost over I've been waiting a year for this game..
@Goob Yeah, I far prefer the original voices myself. I'd have no problem if Atlus just included dual audio to fit all preferences, but since they always ditch the Japanese voices when they provide a dub, I'm glad they didn't have the budget/availability for it this time. Yeah I'm a big fan of the show, but I heard some mixed things about this game. I really wish this digital only game was 30 or 35 instead of 40. Oh well, it's Attack on Titan, so sheep like me will probably buy it anyway. SAO is on vita already, and its awesome btw. i would pay $50 for AOT and not even care. i can not wait till the 12th!!!!! so awesome!! I haven't gotten around to the show yet, and the game without that context looks underwhelming. Kind of reminds me of God Of War and Rygar put into one. Definitely a title I will pick up for the 3DS...as long as it's not a download title. I dont get the copy rights, i mean like what copy rights are there in Europe? Aside from that will this game, the voices, be like sword art online hollow fragment. All the characters talk in japanese but has english sub, so you know what they say. And last thing, is this for all 3ds or is this exclusively for New 3ds. I don't much care for modern anime. Tried Crunchy Roll and hated it. But I started watching Attack on Titan on the eShop and after that I just HAD seek out the rest on Netflix. Its an odd but great show. Hope this game is good. I want it! Even if its rubbish. When was it ever said that there wasn't going to be a dub for this game? Just curious because I can't remember hearing it and I'm in the minority that prefers the dub over the sub so I was hoping for the English voices. The Japanese ones are still pretty good though so I don't really mind either way but still, having the option would be nice. @Transmutation On Atlus USA's Facebook page, the day it was officially announced. Someone asked if there'd be English dub and they clarified there'sll be just the Japanese OVs with English subtitles. This looks totally awesome. Day 1 purchase. I'm very much in the wait for reviews camp. On the one hand Attack on Titan is awesome (and gets most of its hate from hipsters, which makes me love it more) and zipping around Shiganshina could be so much fun. On the other hand I can easily see gameplay devolving into a QTE fest or something else equally unfun. In a way I'm glad it's digital-only, because I'd have a hard time staying away from a print run with any bonuses. They put in Sasha but not Connie!? Waaaaaaaat!? I love the show, but the gameplay looks really dull to me. Fighting titans is far from the meat of the show. @Goob Yep, you need to be 17 or older to download this. But have no fear: fake your oldest voice, call Nintendo, and tell them you entered your birthday wrong on your NNID. They'll change it within a day. This is what happened to me when I wanted to play Ace Attorney: Dual Destinies. I don't understand the obsession with Japanese dubs. Are you all just advanced Nipponiphiles or are there more substantive reasons? Be honest - search your souls. Whole thing is on Netflix. I was impressed with the first episode. On the bright side, you'll probably be old enough to buy it by the time Atlus' $15 sales start including it too. Super interested, but only if it gets a physical release. I'm not down paying full retail price on a digital rental copy of a game I have no rights to. This looks like a lot of fun but I can't justify buying a temporary rental that worse yet is system tied, not account bound. @Mainsaile The voice acting is often far better than the English dubs. This isn't really to slight the ability of the English voice actors though as it's known to be hard to do it well. Are that many people bilingual?